In February, the School Board agreed to add an extra $5 million to $6 million to the undertaking so the project team would not have to rework its design at that point. Board members said they wanted to see the school finished as soon as possible. The date for opening Phase I of the new school remains August 2017, Lempe said during the School Board’s capital budget workshop on March 22 in Sarasota, but it will be necessary for staff to bring the Guaranteed Maximum Price (GMP) for the site plan to the School Board no later than April to achieve that goal. “I’m still hopeful that we’re going to get there,” he added. 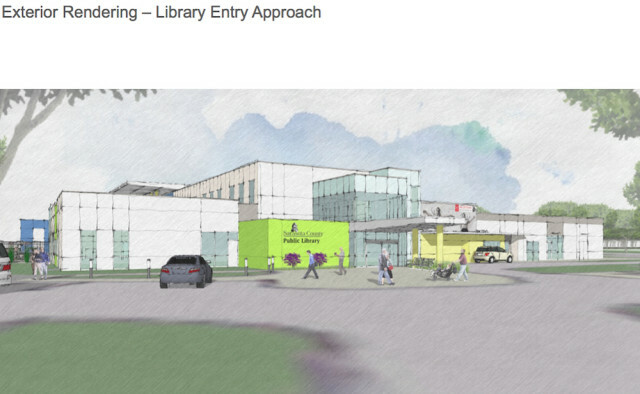 The very next day, he continued, school district staff planned to meet with Sarasota County staff to talk about the design, as the county is funding the portion of the project that encompasses a new library for the City of North Port that the STC students and faculty will share. The county’s expense equates to about one-eighth of the total expense, as the library will utilize about 3 acres of the 24 acres for the North Port STC campus, Lempe noted. A formal agreement has not been signed yet with the county, he pointed out. The projected 2016-17 capital budget for the district includes $6 million for Phase I of the North Port STC; that is in addition to $378,466 spent in the 2014-15 fiscal year and $11,259,156 in the current fiscal year, the five-year capital budget projections show. 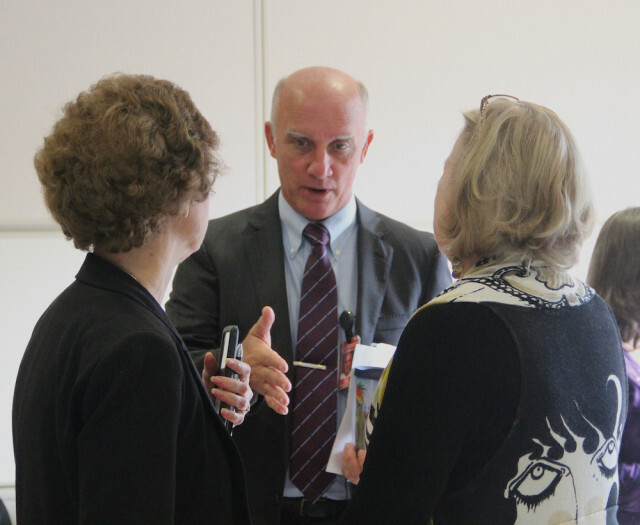 Another $7.5 million is allocated to the project for the 2019-20 fiscal year in the five year capital budget recommendation staff presented to the School Board on March 23. Board Chair Shirley Brown pointed out that the latter figure puts the total at about $25 million. However, Lempe reminded the board members that Todd Bowden, executive director of career, technical and adult education in the district, has said demand for programs will dictate whatever commitment the district makes to the school’s programs beyond those in the first phase. When Brown asked how much the City of North Port is contributing to the expense, Lempe explained that the city already has paid the district for a design change the City Commission requested. That will allow the dining establishment in the North Port STC — the Bistro — to be expanded by 2,700 square feet for conference room space. The expense — approximately $715,000 — is reflected in the budget, Lempe told Brown. In response to a question from board member Caroline Zucker, Lempe said that every project for which the board approved funding in the current fiscal year has been completed or is in progress. 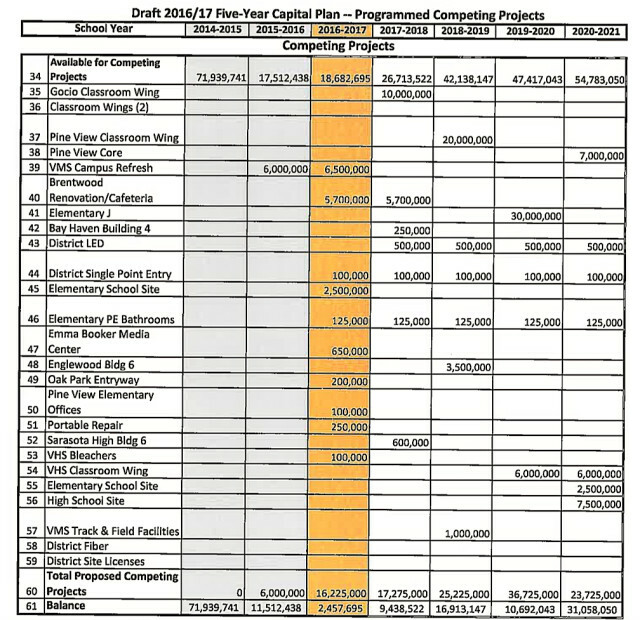 In looking at the staff projections for the 2016-17 capital budget, Zucker noted the estimate of $18,682,695 in revenue for completing projects, with expected costs totaling $16,225,000. That would leave $2,457,695 as a balance. Lempe told her he and district Planning Director Kathie Ebaugh recommended the board proceed with the list of competing projects that would result in those leftover funds. Among them are a “refreshing” of the Venice Middle School campus ($6.5 million in the 2016-17 fiscal year, on top of $6 million in the current fiscal year); renovations at Brentwood Elementary School ($5.7 million); enhanced security measures through the creation of single-point entryways at schools without them ($100,000); and $2.5 million to buy property for a new elementary school campus to handle anticipated enrollment growth in the Venice area. The Venice Middle School project also will address campus stormwater flooding issues within the classroom walkway and adjoining areas, the workshop documents show. “I agree with that [list],” board member Jane Goodwin told Ebaugh and Lempe. 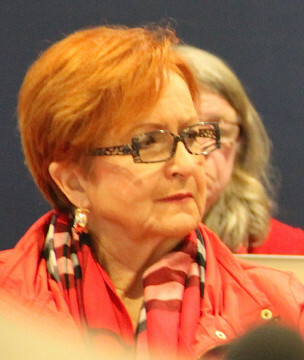 “The current [student] numbers don’t necessitate [new construction],” Ebaugh told her, “but, eventually, that campus will need additional wings.” A total of $12 million is included in the budget — $6 million in both the 2019-20 and 2020-21 fiscal years — to pay for more classroom space at the school, Ebaugh noted. However, she said, staff has not undertaken a scoping process to determine a more exact estimate. “All prices are increasing, my friends in construction are telling me,” Goodwin replied. A number of subcontractors left the area as a result of the Great Recession, Lempe responded, so those remaining “can be quite selective” with the work they bid on. When Zucker asked about $100,000 in the budget for temporary bleachers to seat about 500 people at Venice High, Lempe responded that Venice residents have brought up concerns about the lack of access on the home side of the football field that complies with the Americans with Disabilities Act (ADA). As a result, he continued, the district is spending money to make the home side ADA-accessible, but that process entails the loss of regular seating. “We do need to add some bleachers” to make up the difference, he pointed out. “They are at capacity on the home side,” Goodwin said. When Venice High hosts a game with one of its big rivals, she added, Venice High supporters get upset if they have to sit on the visitor side. Lempe also noted that the district will have a restricted fund balance of $7,219,164 in the 2016-17 capital budget, according to projections, about 7.5 percent of the total. With no dissent from board members, Ebaugh and Lempe said they would prepare a final draft of the capital budget for the fiscal years 2016-17 to 2020-21 for the board to review in April.